Today, I finally received my new cauldron. That's it, my lab is operational! I had been harvesting and drying ingredients for days ... I wonder what I'm going to mix to start with! My intuition pushes me to mix raven feathers with a mandrake root, but as people swear by the pustules of toad ... And then damn, why listen? It's my laboratory, it's my research! I do what I want! As soon as I publish my theories, no one will look at me wrong. I am determined to prove that I am the greatest genius in the history of alchemy. Now it's time to light my fire and get to work. Wealth, fame and knowledge are within reach, carpeting somewhere in the dark background of this cauldron. Players gain knowledge by mixing ingredients and testing the results with an application (tablet or smartphone) to scan and recognize the game cards. They will progressively deduce how to make the Potions they can sell to the Adventurers . The Gold Coins won can be used to buy Magic Artifacts, very expensive, but very powerful. Reputation players will evolve according to their publications, but may also fall if their theories are wrong. At the end of the game, the Reputation, the value of the Artifacts and the Grants obtained will be converted into Victory Points. The player with the most Victory points will be declared the winner. 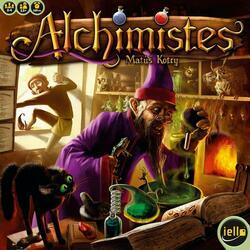 Alchemists is a game of strategy, risk-taking and deduction. Are you going to take the time to push your experiments and check your theories, or will you hurry to publish to earn a fast reputation? Will you pay to confirm the latest toad theory, or keep your money to buy an artifact? Is it really wise to sell a potion to this heavily armed barbarian when you are not quite certain of its effects? Make the right choices and show everyone that you are the greatest alchemist in the world. This game is intended to be played through an application that turns your tablet or smartphone into a card reader Ingredient. This app is completely free. Compatible systems: iOS, Android, Windows ..